Let’s be honest here, the body can be a very gross place. It has a lot of fluids and a million things that can get messed up, causing those fluids to leak or come out of places that they are not supposed to. Take mucus fishing syndrome for instance. There’s a good chance you’ve never heard of it before, but there’s an equally good chance that you know someone who has had it, or perhaps you’ve had to deal with it yourself. To that end, we’re going to take a look at mucus fishing syndrome. We’ll cover the symptoms, the complications, and symptoms of mucus fishing syndrome, as well as how it can be diagnosed and treated, both medically and naturally. 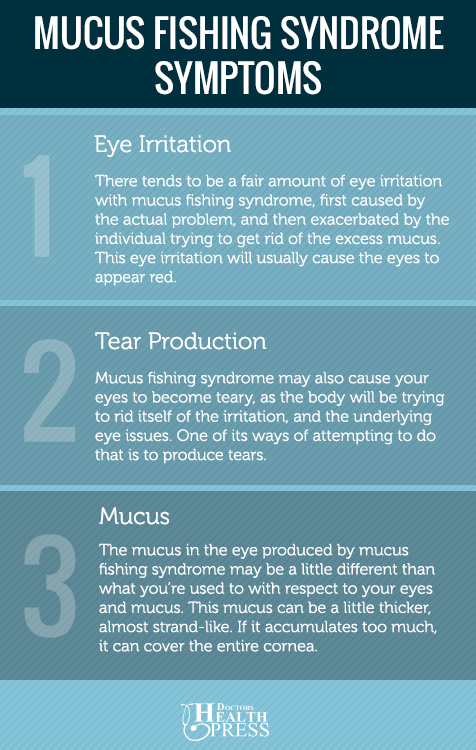 Mucus fishing syndrome is caused by a build up of mucus in your eye. Specifically, it gathers in the lower eye lip and can begin to impair vision. This excess mucus can be due to another medical condition that has caused excess mucus production—like dry eyes, pink eye (conjunctivitis), pterygium and blepharitis. Due to this mucus build up, the sufferer may have other complications like dry eyes, redness, and irritation due to rubbing their eyes and trying to relieve any excess mucus with tissues, clothes, cotton balls, etc. Mucus fishing syndrome gets its name from the idea that the sufferer is trying to “fish” the mucus from their eyelids. Unfortunately, more often than not, this just causes more eye irritation. This can, in fact, lead to more mucus being produced to combat that irritation. Many eye irritations end up feeling very similar. 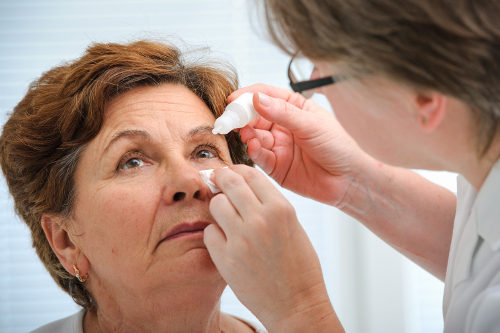 How do you know the difference between mucus fishing syndrome and other eye issues? Is the mucus different in color? What are the symptoms of mucus fishing syndrome? Recognizing that you have mucus fishing syndrome might be harder than you might think for a few reasons. As we mentioned before, the reason why you have mucus fishing syndrome a majority of the time, is due to another eye issue that is causing your eye to produce excess mucus. As a result, many of the symptoms of mucus fishing syndrome are very much the same as other eye issues. There tends to be a fair amount of eye irritation with mucus fishing syndrome, first caused by the actual problem, and then exacerbated by the individual trying to get rid of the excess mucus. This eye irritation will usually cause the eyes to appear red. Mucus fishing syndrome may also cause your eyes to become teary, as the body will be trying to rid itself of the irritation, and the underlying eye issues. One of its ways of attempting to do that is to produce tears. The mucus in the eye produced by mucus fishing syndrome may be a little different than what you’re used to with respect to your eyes and mucus. This mucus can be a little thicker, almost strand-like. If it accumulates too much, it can cover the entire cornea. You have now seen the symptoms and think you may have mucus fishing syndrome. Is there any way that it can be diagnosed? You have all of the symptoms of mucus fishing syndrome—you have an irritated eye, your eye is producing excess tears, and you have mucus strings in the eye. So, now it’s time to go to the doctor and get a proper diagnosis. But can the doctor actually diagnose mucus fishing syndrome? It’s very similar to other eye conditions and it’s caused by other eye conditions, so how do they know what’s going on? Doctors and optometrists will recognize it fairly quickly due to the mucus in the lower eyelid, along with the other symptoms. More importantly, they will also be able to diagnose the cause of the mucus fishing syndrome, which is why it’s important to get your eyes checked out as soon as possible if the symptoms start appearing. While pink eye doesn’t sound like much, if left untreated, it can do serious damage to your eye. Once the problem is diagnosed, there are a few mucus fishing syndrome treatment options available to you. These will usually help clear up the problems that are causing the mucus fishing syndrome, and the mucus will soon dry up afterward. There are also some natural remedies that you can use to help clean up your messy eyes. If you are fairly certain that you have mucus fishing syndrome but may have to wait a day or two in order to get a doctor’s appointment, there are a few natural remedies that can help take care of the symptoms of mucus fishing syndrome. This can relieve some of the irritation and help to keep the eye moist. Just make sure you don’t use it on the uninfected eye, as the compress could spread the cause of the mucus fishing syndrome to the other eye. This can be easier said than done, as the irritation can be a pretty good driving force to get you to rub your eye. However, if your keep it to a minimum, more irritation won’t be caused. If you do these treatments, it should help a little before you do see a doctor. Mucus fishing syndrome can be annoying and gross, but it shouldn’t be ignored. While it may go away if you stop touching it and use a cold compress, it may not. With the types of eye issues that can cause mucus fishing syndrome, it’s not something you want to play around with. Hopefully, you are now armed with all of the knowledge that you need to not only recognize mucus fishing syndrome, but to recognize it early, so you can get it treated and quickly cleared up. Pietrangelo, A., “What You Should Know About Mucus Fishing Syndrome,” Healthline, February 2, 2017; http://www.healthline.com/health/eye-health/mucus-fishing-syndrome#Overview1. Gabrielle, “Mucus Fishing Syndrome: What Can You Do to Deal With It?” EnkiVillage; https://www.enkivillage.org/mucus-fishing-syndrome.html. Slagle, W. S. et al., “Mucus Fishing Syndrome: Case Report and New Treatment Option,” Optometry, October 2001; 72(10):634-40. https://www.ncbi.nlm.nih.gov/pubmed/11712630. Kerkar, P., “What Causes Fishing Mucus Syndrome and What is its Treatment?” ePain Assist, March 4, 2017; https://www.epainassist.com/eye-pain/what-causes-fishing-mucus-syndrome-and-what-is-its-treatment.